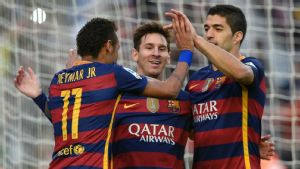 Xavi has called Barcelona’s forward trio of Lionel Messi, Luis Suarez and Neymar the best in the sport’s history. The South American attackers led the Blaugrana to an historic Treble of La Liga, Copa del Rey and Champions League titles last season, and helped guide the club to Club World Cup glory in December. Messi and Neymar were named to the three-man shortlist for the Ballon d’Or, which Messi won for a record fifth time. And Suarez, who collected a hat trick in Sunday’s 6-0 thrashing of Athletic Bilbao, currently tops the La Liga goals chart with 18. In an interview with Marca on Monday, former Barca great Xavi hailed his former teammates, as well as coach Luis Enrique. “Luis Enrique has evolved Barcelona,” Xavi said. “He is serious, very professional. “Barcelona now also have players capable of playing two ways. When we have the ball, with possession; but now, if you flinch, they go on the counter and this is an option handled perfectly. “Neymar, Luis Suarez and Messi are amazing. We do not need much preparation — these three are able to create attacks on their own. “And then there is what lies behind: Busquets, Pique, Alba, Rakitic, Alves … a great team. “We have the best attack in the world, I think it is the best forward line in history. Despite Barca’s potency up front, it’s Diego Simeone’s Atletico Madrid who sit at the head of the league table, though Barcelona have a game in hand. Xavi has been impressed with what he’s seen from the Los Colchoneros thus far. “I enjoy Atletico,” Xavi said. “Simeone has improved the team — more players, more solutions. Atletico and Barca rivals Real Madrid have been on the upswing since hiring former club legend Zinedine Zidane earlier this month, scoring five goals in each of the Frenchman’s two games in charge at the Bernabeu. Xavi said of Zidane: “I know him and I’m sure he will do well.